The Master program is designed for graduates with specialized candidates interested in a career in software development and management of software teams and projects. The program is designed and intended for people working in the software business, which have expressed interest and acquired skills in programming and software development. Admission Requirements: Completed Bachelor Degree in Computer Science/Systems and entrance exam. Students can participate in practical classes at the university and in a real environment in software companies. Students can participate in mobility for learning or to practice EU`s programme Erasmus+ giving them the opportunity to learn about European practices and to receive training for a successful career in international teams. Students can participate in annually organized additional placements, master classes and practices in Bulgarian and foreign companies and organizations, as well as free courses, seminars, meetings with software companies, academies and summer schools on current topics in the professional field "Informatics and Computer Science". This contributes to the deepening of relations of the Department with representatives of companies and building professional contacts of students at VFU with experts from practice. Students in the Master`s program can work as managers of software teams, managers of software projects, experts in quality, managers of software companies, software engineers and others, analysts, developers, IT specialists, quality control, consultants and others in the IT industry. Students in the Master`s program acquire the necessary knowledge and skills to start their own business in IT industry. Students who successfully completed the Master`s program may continue their studies in Ph.D programs in various fields of modern computer science. Candidates must be graduates in one of the following professional areas: Mathematics; Computer Sciences; Computer Science or Software Engineering or have higher education in other professional area and grade 3 or 4 in the professional field "Informatics and Computer Science". Candidates should have practical experience which is evidenced by a copy of a document certifying of their experience in a company (2 years) or prove their experience with interview before a commission of professional field "Informatics and Computer Science", which can present their specific experience in real software project, published in Github source code and more. The interview and they certify their level of English. They show their knowledge of English interview. Get to know the skills and professional experience of all lecturers, consultants and mentors that will work with you in the master's program of "Software Engineering and Management"
Assoc. prof. Galina Momcheva, PhD. 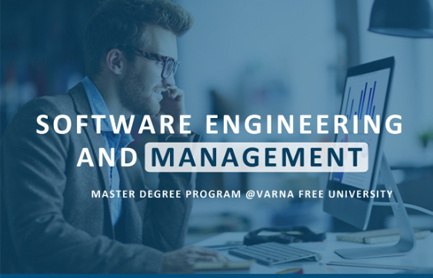 Check out the schedule of the master program in Software Engineering and Management at Varna Free University. The information will helps you to understand the value of the programm and the key new skills, that you will gain. During the 2 semesters you will have 8 compulsory courses. During the program you will have a choise between 7 elective courses. During the program you will have a choise between 3 optional courses. The curriculum of the Master's program in "Software Engineering" & Software Engineering and Management was developed in accordance with the requirements of Computing Curriculum - Software Engineering (CC-SE2004), the ACM and IEEE. The success of our Master`s program is guaranteed by our work with partners like Sirma Group, ICT Cluster - Varna, ESI etc. Since 2014 Master program is conducted with the support of ESI (European Software Institute) - European Software Institute. Sign in to get us better! We will be happy if you decide to join our list of friends. If you are working in the area of IT or Software Engineering, if you have a company or you are planning to start a new company, we are a 100% sure, that you have to subscribe! We promise to send you only important and useful information. Varna Free University „Chernorizets Hrabar“ is the biggest and most acknowledged private university in Bulgaria. This Master program will help you to boost your career as a Mentor or Trainer. Also you will have a contact with experts! APPLY NOW!